Tara Henley is a writer and broadcaster. Her work has appeared on the CBC, and in the LA Times, the Guardian, the Globe and Mail, and the Toronto Star. Stephanie Williams’s apple pie sends Celestian Rince into raptures. The homemade pastry and filling, superior in taste and texture to anything you can buy. The heady scent that fills the couple’s bachelor apartment as it bakes. The time and care that she devotes to making it. And then there’s one other factor: the ingredient cost. The homemade dessert has become a symbol of the frugal life they share. Rince and Williams, twenty-eight and thirty, are part of an anti-consumer, penny-pinching movement that’s finding favour with millennials—a generation more often cast as a group of entitled social-media addicts who live at home, work little, brunch with abandon, and expect their boomer parents to foot the bill. If their practices sound a bit like those recommended by old retire-rich handbooks The Wealthy Barber or Your Money or Your Life, that’s because they have elements in common; these early retirement enthusiasts have adopted a simple philosophy, applying such age-old principles as thrift, ingenuity, and self-sufficiency to the modern age. In a twist that feels uniquely millennial, they meticulously record and then share their expenses on a personal-finance blog, incomingassets.wordpress.com. Rince and Williams live in a co-op housing complex in the Vancouver neighbourhood of Gastown, blocks away from their downtown jobs. As they walk or cycle almost everywhere, they don’t need a car or even take transit. They plan their weekly menus with care, comparison shopping to find the best prices, and eat all of their meals at home. These efforts minimize spending on food, shelter, and transportation—a household’s biggest expenses. Then there are the extras. The couple doesn’t frequent coffee shops, smoke or drink, or—notably, in 2017—own smartphones. They spend little on household items and clothing; in 2015, for example, their joint total spending on shoes was $241, which they felt was too high. For entertainment, they attend free lectures and borrow books, movies, and video games from the library; score deeply discounted “under thirty-five” tickets to the Vancouver Symphony Orchestra; hike on free trails; and host dinner parties. Their budget does include one big splurge—$9,000 a year for international travel to such places as Guatemala, France, China, and Thailand. It costs the two of them less than $1,500 a month to live—and that number includes the $787 rent on their 400-square-foot apartment. Their combined income, meanwhile, is just under $90,000 a year. They save roughly 60 percent of it. When their investment income hits a point that it can pay the bills, they’ll bid their jobs as receptionist and administrative assistant adieu. Their savings amount to about $260,000. Much of the thinking behind their lifestyle originated with a brash blogger known as Mr. Money Mustache. Originally from Caledonia, Ontario, Mr. Money Mustache (a.k.a. Peter Adeney) lives outside Boulder, Colorado, and is a purveyor of what he calls financial “badassity.” At forty-two, he’s been retired for more than a decade. Adeney runs a personal-finance website, mrmoneymustache.com, which has 750,000 unique visitors a month. He lives with his wife and eleven-year-old son on as little as $24,000 a year. As The New Yorker reported in a 2016 profile, he refuses to buy a mop, since washing the kitchen floor with a sponge works just fine; his spending is so finely calibrated, he’s still kind of pissed about a Rubik’s Cube he bought for his son in 2015 that broke. It would be easy to say that Rince and Williams will “grow out of it” once the demands of traditional adulthood catch up to them. But the Mr. Money Mustache Meet-Up group Williams co-founded two years ago includes such people as Trevor van Hemert, who lives in co-op housing in Burnaby with his wife Brittany and two-year-old son. He hasn’t “worked” in the traditional sense—i.e., for someone else—in seven years. This modest lifestyle allows him to be an involved father—he stays home with his son, while his wife works full-time. He grows food in community plots, is planning a garden for his co-op, and volunteers for Car Free Day. He also runs a blog (Indie Personal Finance) and contributes to the site earlyretirementextreme.com. The writing of Neil Howe—one of the co-authors of the 2000 book Millennials Rising, which likens millennials to the GI generation that rebuilt society from the ashes of the Second World War—has caused van Hemert to think about the role that he and his peers will play in shaping human history. Thrift alone won’t solve the crises millennials are facing—what van Hemert calls “a fever pitch of problems”—which include everything from climate change and political gridlock to the astronomical cost of living. “The criticism from baby boomers is that millennials don’t know how to handle their money,” he says, citing the wry logic of a recent Guardian article that demonstrates that even someone who forgoes their $22 brunch every week would need to save for 175 years to make a down payment on a house. People his age are starting urban farms and camping illegally in vans. Van Hemert and his wife themselves lived in an RV until recently, and he once lived in a sailboat. 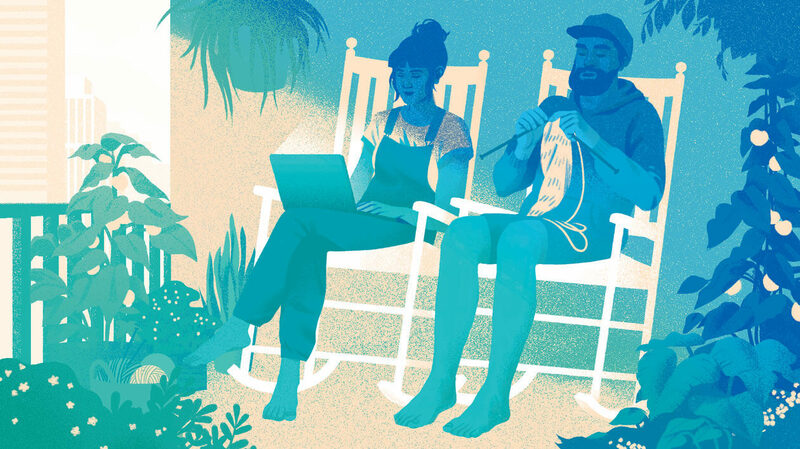 For millennials like him, alternative business models, unorthodox living arrangements, close-knit digital communities, and old-world skills are filling the void left by the disappearance of affordable housing, stable jobs, decent incomes, and benefits. From the outside, it all seems like a lot of work—not only to dedicate time and effort to frugality in an age of convenience, but also to step, essentially, outside one’s own culture. Vancouver is, of course, a place where it’s not uncommon to see teenagers speed past in Lamborghinis, young couples laden with bags from Chanel and Prada, and mega-mansions torn down and rebuilt at great expense, only to sit empty for all but a few weeks of the year. In the land of lavish opulence, voluntary austerity is a radical lifestyle to adopt. But even so, the most striking thing about a couple such as Williams and Rince is not their adherence to thrift—it’s their lack of stress. Williams and Rince don’t worry about being laid off, fired, or outsourced. They are undaunted by the city’s housing crisis. They feel confident that whatever life throws at them, they will be (financially) okay. For the same reason, they don’t feel pressured to work long hours or to sacrifice their own ideals for the sake of job security. As a classic Gen Xer in Douglas Coupland country, I can’t overstate just how appealing this sounds. Stress defines our existence. Like many of my generation, I endured my twenties and thirties in perpetual anxiety about keeping my head above water. That continues in adulthood. We vault out of bed every morning in a state of panic, making hurried stops at coffee shops—either to stave off despair or for the adrenaline needed to face the day—only to slog for ten or twelve hours at “prestige” jobs that don’t pay overtime. Those of us who have children struggle to slip away from the office at five (“Leaving so early?”), rushing to daycares that eat up half our salaries. In spite of such herculean efforts, we often find ourselves scraping by—struggling to keep up with rising rents or runaway real estate markets—a mere paycheque away from calamity. The lifestyle Williams and Rince are modelling, as extreme as it sounds to a person accustomed to artisanal coffees and designer handbags, is still far less extreme than the one we are living. It’s also hard to argue with their priorities, given both the environmental impact of North American living and soaring personal-debt levels (Canadians’ debt-to-income ratio currently sits at a record high of 167.3 percent—meaning it would take an average of 67.3 percent more than we earn in a year, after tax, to cover such household debt as mortgages and credit cards). Still, there’s something about this conversation that feels at times out of touch with the psychology of the cash-strapped middle classes—let alone the working poor. I grew up poor. I know what it feels like to wear second-hand clothes and to pine for designer jeans. To watch my single mother anxiously count out change for bus fare to school. To live in fear of dental emergencies and Christmas. To live in poverty is to live in a constant state of emotional crisis, without a safety net. As an adult, I’m more frugal than most. I take public transit, often cook at home, shop little, track spending, and am debt-free, after making my final student-loan payment not long ago. But anything that even hints at involuntary deprivation takes me back to that old insecurity—and a craving for creature comforts. So I think it’s important to recognize that there are many reasons for spending money beyond literal survival—and that one of the luxuries of a lifestyle like Rince and Williams’s is the knowledge that one could, at any point, rejoin the middle-class mainstream. It’s worth noting that they arrived at their lifestyle via radically different routes. Rince is a child of privilege. Born in Singapore, he immigrated to Canada as a toddler. As far as he can tell, his parents have not worked since. He graduated from the University of British Columbia, debt-free, with a degree in creative writing. Meanwhile, Williams is the daughter of two teachers. She was born in Golden, BC, grew up in the Okanagan, and then, after her parents’ divorce, lived in rural Manitoba, where she finished high school through correspondence. Her financially astute father retired at fifty-nine; she started reading personal-finance books as a teen. Thrift is all she’s ever known. The couple doesn’t want to have children (in fact, a framed certificate confirming Williams’s Fallopian tube removal hangs in the living room). They don’t aspire to home ownership, or even car ownership. If they marry, they won’t throw a big bash. The early retirement approach does seem viable in a way that middle-class striving no longer does. It seems as if thinking about the world through the lens of maximizing your independence by minimizing your overhead could, at best, transform your life and, at worst, result in your amassing thousands of dollars in savings.